Sri Lanka suffered a 30 year-old war which brought suffering to many people both in the North and South of the country equally, irrespective of class, clan, creed and nationality. But among those, the ones who most suffered were the children. Some lost both their parents and others lost only one and even the parents who survived were physically handicapped due to injuries. The children of the northern part of the country were the real victims of the 30 year old curse. They grew up in an unhealthy environment where they saw nothing but the calamity and the destruction of war from morning to evening. These experiences led a lot of the children to a traumatic situation, so much so that they could not even concentrate on their elementary education. Childhood fantasies were so far away for them. The Centre for Society and Religion, popularly known as CSR, began the mission of rehabilitating the victims of war soon after the war ended in 2009. This mission was called “the ministry of presence” and attention was focused on people who lived in the Internally Displaced Persons (IDP) camps. At the very beginning, CSR did nothing but just be with the victims, listening to them, trying to look for ways and means of getting support to fulfill their basic human needs such as food, clothing, sanitation and medication. As the IDPs were settled and the camps were slowly removed, CSR launched into the second step of the mission in 2013; it was called, “the project of peace and reconciliation”. The IDPs who were settled in a particular divisional secretariat called NEDUNKERNY were chosen as the geographical area and 5 villages of this area became the mission territory of CSR. These were among the many villages where the war was thick and heavy towards the last stage and therefore people were severely affected by the loss of lives and property. CSR rented a small house in the middle of these 5 villages and called it “CSR Centre–Nedunkerny”, and a staff of 5, including two reverend nuns, were recruited to carry out the mission. The mission contained many components such as forming women and farming groups, supporting them with livelihood programs, giving people a rights-based education, and also promoting nutrition and education among children. As children were the most affected segment of war, our special attention was focused on this particular component. We started with a small group of children, between 20-30, and started working with them. We taught them English and mathematics and fed them with a snack during the classes. Gradually the number started increasing. We found that some of them were extremely traumatized, and obviously it was due to what they have seen and experienced. We recruited volunteers among them to teach the children, and today, after 3 years, we have 183 children. Almost all the children of the nearby village government school are coming to our centre, and so we are now invited by the principal of the school to teach the children in the school as well. This year is our last year of implementing this program, and we have called it “the exit strategic year”. After 4 years we expect the villages to move on all by themselves. Right from the very beginning in 2009, my experience was that the most important tool of working with these victims was nothing but our openness and willingness to reach them as “a group of our own” and NOT as a group outside who needed our help. As we were a group coming from the South to work with them, initially their reaction was not very positive, as it was the Southerners who fought the war against them. But eventually the relationship grew and they started feeling comfortable with us. This was very visible in children. We always identified ourselves with them and used inclusive language all the time. We were neither judgmental nor critical of anything related to them. We honestly accepted their feelings and empathetically received them as they are. Thus in the midst of violence and conflict of war, we found that our ways of thinking, listening and speaking in ways that awaken compassion and generosity between ourselves motivated us to reach each other without fear or guilt. Let me tell you that this a noticeable change in approach towards each other by the two ethnic communities which is now seen not only in CSR but also in the entire country. People of the south are more compassionate towards the people in north who suffered immensely due to war. The change of political regime in 2015 has given a huge boost for a lasting and sustainable political solution to the ethnic problem. The civil society is more active and aware of their rights and duties as “citizens” of the country. The ongoing discussions towards drafting a new constitution is a great opportunity for the people of the country to rectify most of the loop holes which paved the way to a lot of differences between nationalities, religions and languages. As our attempts were very successful and fruitful with children and became a good investment towards a sustainable future in Sri Lanka, I feel that the Church in Sri Lanka too must consider the same as a good vineyard for her future mission. The children and youth are the best components where the Church could invest her energy to link the 2 ethnic communities. The Buddhists in Sri Lanka are Sinhalese and they mostly live in the southern part of the country. The Hindus are Tamils and they mostly live in the north. But the Catholics in Sri Lanka are both Sinhalese and Tamils and they live not only in North and South but also in East and West. 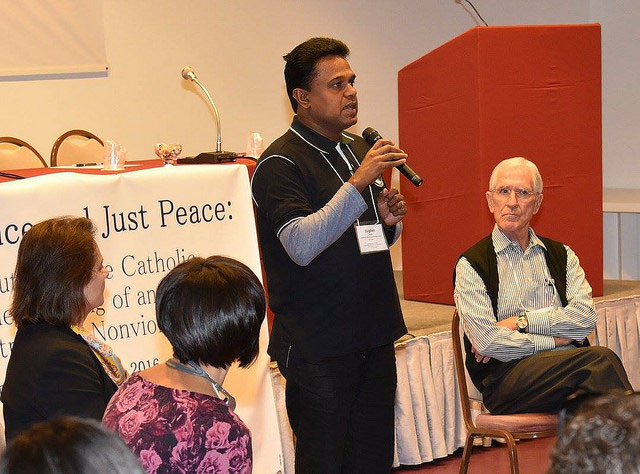 Therefore the Church in Sri Lanka has a very good fertile soil where she could plant the seeds of nonviolent communication for a deeper reconciliation, starting with the children and youth. They are a sure way of building the bridge between the 2 ethnic communities, not only in the Catholic Church, but also in the entire country. The other important area where the Church in Sri Lanka could invest her energy is to get actively involved in contributing to the formation of the new constitution which is currently the hot topic in the country. These days all over Sri Lanka, different sectors and classes of people are pooling their opinions to a committee appointed by the government whose duty is to submit a report to the Parliament on “public recommendations towards the new constitution”. Unfortunately the Church in Sri Lanka is very backward in getting involved in these types of issues. But these are golden opportunities for the Church to influence and promote her theories of nonviolent communication.